Welcome to Jim's Music Room! This is the Internet home of Jim Farmer, a singer/songwriter who resides in San Antonio, Texas. Jim writes and records songs in an eclectic style that could be classified as jazzy pop/rock with folkish influences. To learn more about Jim and his music, feel free to explore the various links listed at the top of the page. If you'd like to contact Jim, please send him an e-mail. NEWS FLASH - Jim performs at USA Songwriting Competition Showcase in Austin. 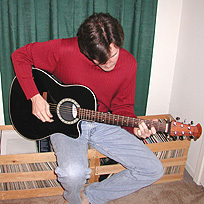 On December 26, 2003, Jim performed a 25-minute acoustic set of his songs at a USA Songwriting Competition Showcase to be held in Austin, Texas, at Borders on Research Blvd. See the LATEST NEWS page for details.